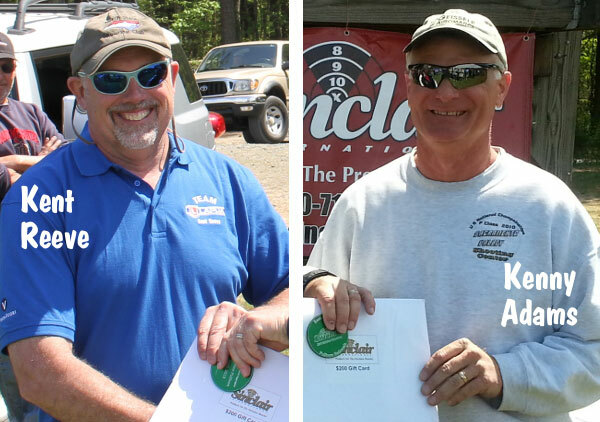 First off, congratulations to the 2013 National Champions: Richard Schatz, 2013 NBRSA 600-Yard National Champion, and Jerry Tierney, 2013 NBRSA 1000-Yard National Champion and F-Class Bench Winner. In those matches when you aren’t shooting too well it pays to be lucky — ask Ken Schroeder. Ken’s was the first ticket drawn in the prize drawing. 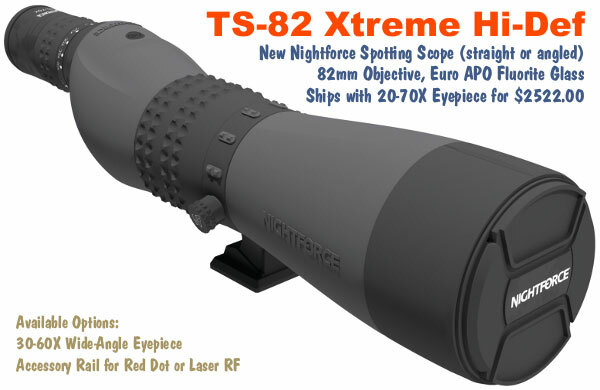 Ken is now the proud owner of a NightForce Scope. Be sure to write the vendors that provided prizes/awards and thank them for their support of the 2013 NBRSA Nationals. The weather for the matches was pretty nice this year and I think that everyone had a good time. The only one that I saw that was unhappy was Bill Hubina. Bill was mistakenly left off the bench sighnup for the 1000 Yard and was not very happy about getting stuck on Bench 25 by himself. He seemed okay about it after he won the Heavy Gun Group. The only record broken this year was 3-Target Light Gun Score. The old record was broken by both Robert Hoppe 50-2, 49-2, 48-0, 147-4 and Richard Schatz 49-2, 49-1, 49-1, 147-4. Once again congratulations to Richard Schatz and Jerry Tierney. I look forward to seeing you all again next year at the 2014 Nationals. These three MS Word “.Doc” Files contain all the groups and scores for the three different matches. Check them out for all the winners and see how close you came to being the 2013 National Champion. 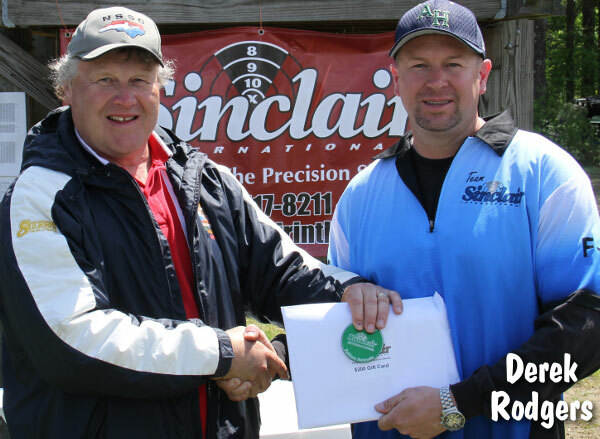 Share the post "NBRSA 2013 Long Range Nationals Complete Results"
Jerry Tierney was the big winner this weekend at the NBRSA Long-Range Nationals. On Friday, shooting his .284 Win F-Open rig from the bench, Jerry won the “F-Bench” match with a 393-16X score (200-7X + 193-9X). Jerry followed Friday’s win with a dominant performance in the Sloughhouse 1000, posting the best combined Two-Gun Aggregate to win the two-day 1000-Yard Championship event. There was a good turn-out for these events, with about 40 shooters in the F-Bench match and a half-dozen more for the 1000-Yard Nationals. On Friday, Jerry shot his 21.5-lb F-Open rifle. On Saturday and Sunday he used that F-Class rig in Heavy Gun, and shot a converted Palma rifle with a .284 barrel in Light Gun. Jerry was loading H4831sc with Berger “orange box” 180gr hunting bullets in both guns. Jerry’s 21.5-pounder has a really long throat allowing Jerry to “hang the bullets way out there” and load more powder. That gives him higher velocity, about 90-100 FPS more than his shorter-throated .284 Light Gun. Jerry tells us: “The long throat is working really well. You’d be surprised at how little shank I’m running in the necks, but the accuracy is there, and you can get a lot more velocity when you adjust the load for the increased boiler room”. Jerry has also long-throated a .308 Win rifle for shooting the 185s and he is getting “really good velocities for that bullet in a .308 Win”. 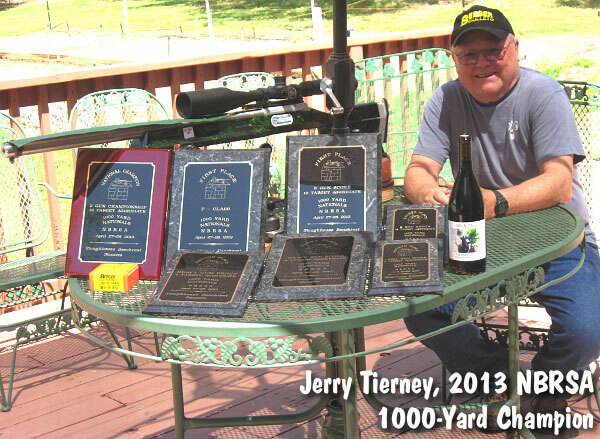 Jerry Tierney with Awards from 2013 NBRSA Long-Range Nationals. Jerry, now a gentleman wine-maker, presented some of his Tierney-bottled “Sin & Zin” Zinfandel as prizes in the match. In winning the F-Bench Match and SloughHouse 1000, Jerry racked up another five NBRSA Hall-of-Fame points. 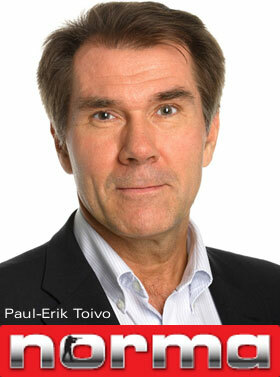 He is now the leading NBRSA HOF’er with 20 points. When asked for his successful match strategy, Jerry replied: “watch the flags and keep ‘em in the middle”. 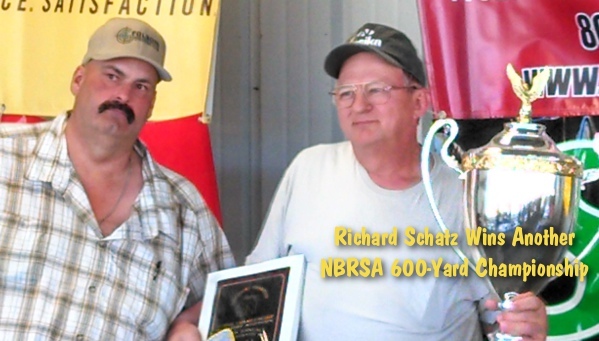 Perhaps the 600-yard competitors are lucky that Jerry had Jury Duty earlier in the week so he could not participate in the NBRSA 600-yard Nationals, won by Richard Schatz. Jerry was certainly “on his game” Friday through Sunday. Editor’s Note: We will augment this story with full match results as soon as they are available. If any readers have a copy of the final results, or photos from the match, please send them to us. 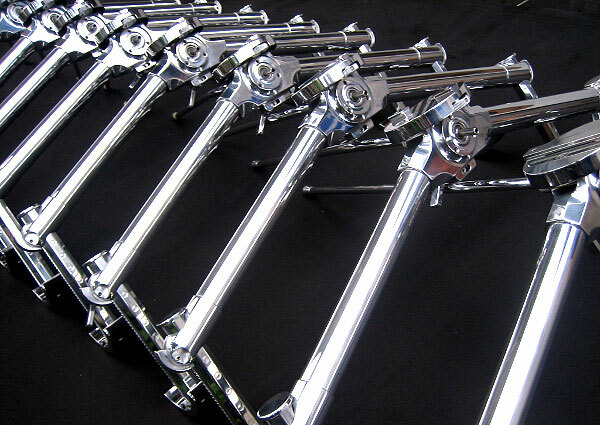 Our email address is: mailbox [at] 6mmbr.com. 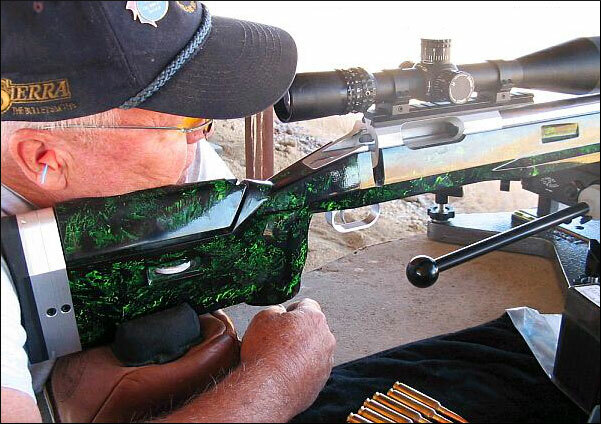 Share the post "Jerry Tierney Wins NBRSA 1K Nationals and F-Bench Match"
Readers said they enjoyed our write-up of an innovative, offset-stocked Heavy Gun that set three multi-match Aggregate IBS records last year. If you’re a fan of “Heavy Artillery” here’s an impressive rifle from Forum member ‘Straightpipes’ that we spotlighted last year. 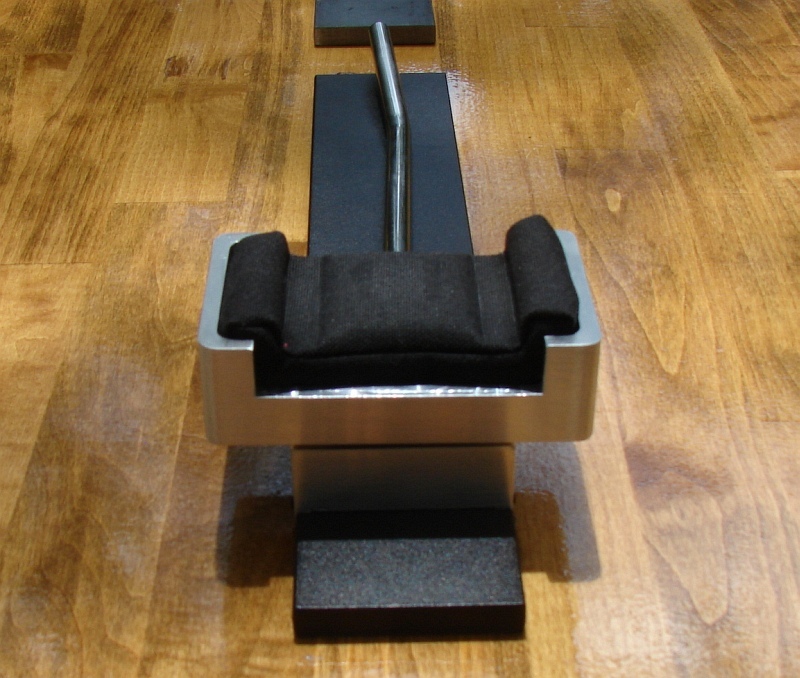 If you missed it the first time — check out this engineering Tour De Force, complete with a custom-built, joy-stick REAR rest. We’re mightily impressed by the cutting-edge design and superb metal-work displayed by this “home-built special”. 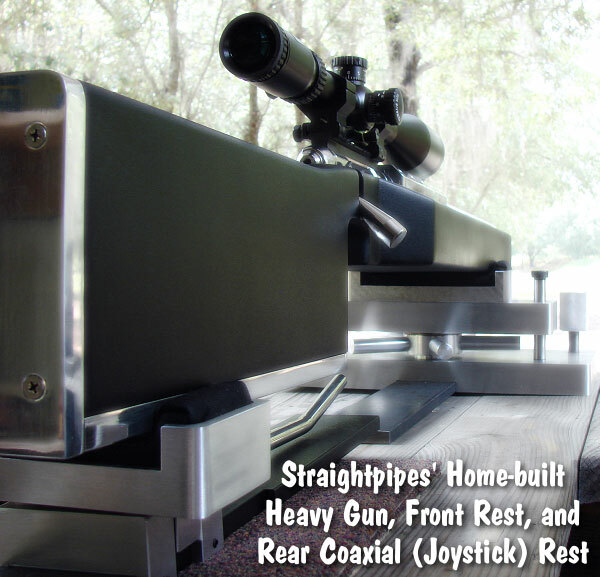 ‘Straightpipes’ certainly proved that American “know-how” and creativity is still alive…. 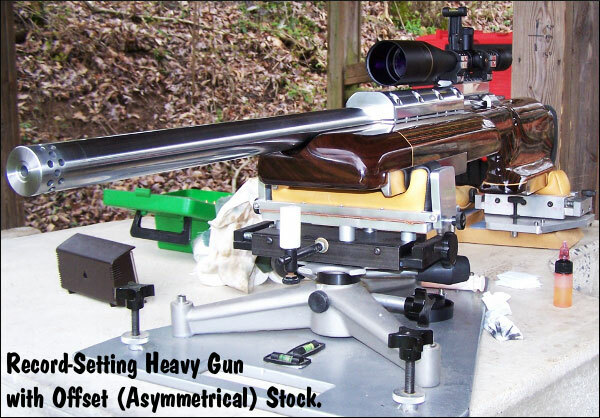 Share the post "Heavy Artillery — Remarkable 7mm WSM with Joystick Rear Rest"
After taking a few years off from competitive shooting, in 2012 Mike Gaizauskas returned to the long-range rifle scene in a big way. 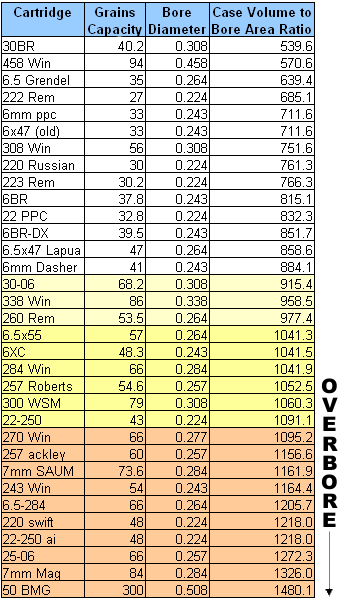 During the course of the Virginia 1000-Yard Benchrest Club’s 2012 season, Mike set three new IBS 1K multi-match Aggregate records. Mike broke into the record-books using a very unique 300 WSM rifle that incorporates a lot “brainstorming” and help from Mike’s friends and colleagues. 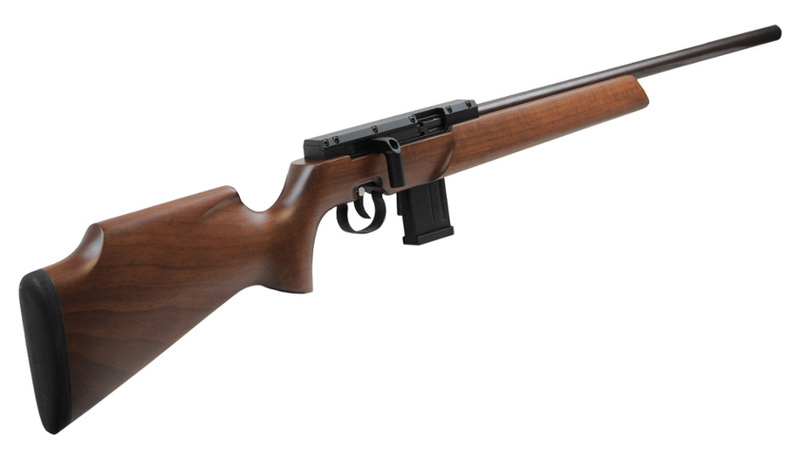 The record-setting rifle features a super-wide forearm which is also offset. 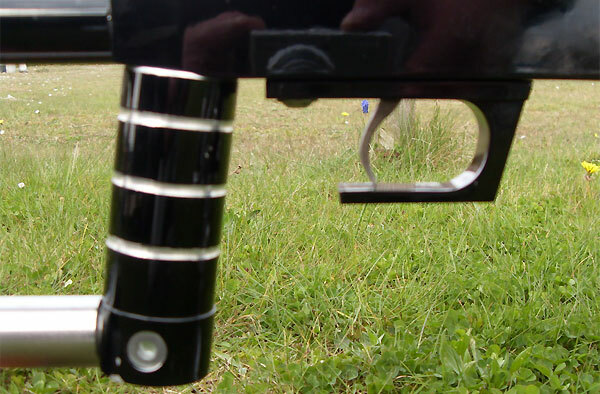 (As viewed from the shooter’s position, the stock is wider on the left, off-setting the barreled action to the right). This Heavy Gun has proven to be super-accurate — Mike barely missed setting a new IBS 10-shot-group HG record by a couple thousandths. 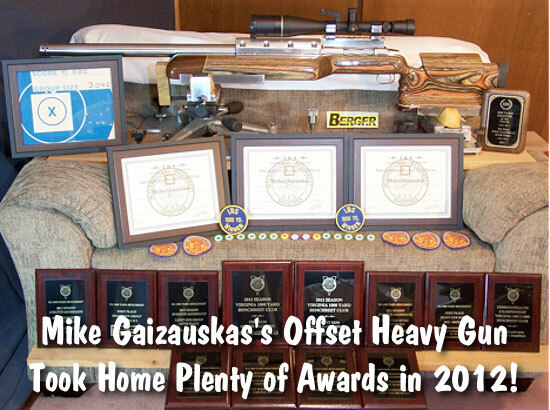 In 2012, Mike came “oh-so-close” to breaking the current IBS 1000-Yard Heavy Gun 10-shot small group record of 3.044”. Using his offset HG shown below, Mike drilled a 3.046″ 10-shot group, just two thousandths of an inch (.002″) off the current record. FYI, the thickness of a typical human hair is .001″ — you can’t get much closer than that! 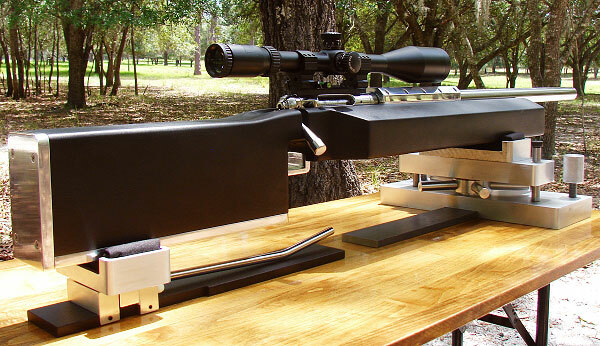 The record-setting gun was built with components gathered over time, which were then fitted into a new ultra-wide stock. Mike ordered two custom stock blanks from Richards Micro-Fit Stocks of Sun Valley, CA roughed to Mike’s specifications. One was for a Light Gun, and the other was for a Heavy Gun. Mike had been thinking about an offset design for some time. During the 2007 Nationals held at the Virginia 1000-Yard Club, Mike just happened to sit next to Dave Tooley for a day. Mike and Dave discussed at length Dave’s experiences and conclusions regarding offset stocks. Dave explained that an asymmetrical or offset forearm is designed to counter the longitudinal torque that occurs when the gun is fired. You can find these concepts featured a few years back in the 6mmBR.com Blog. 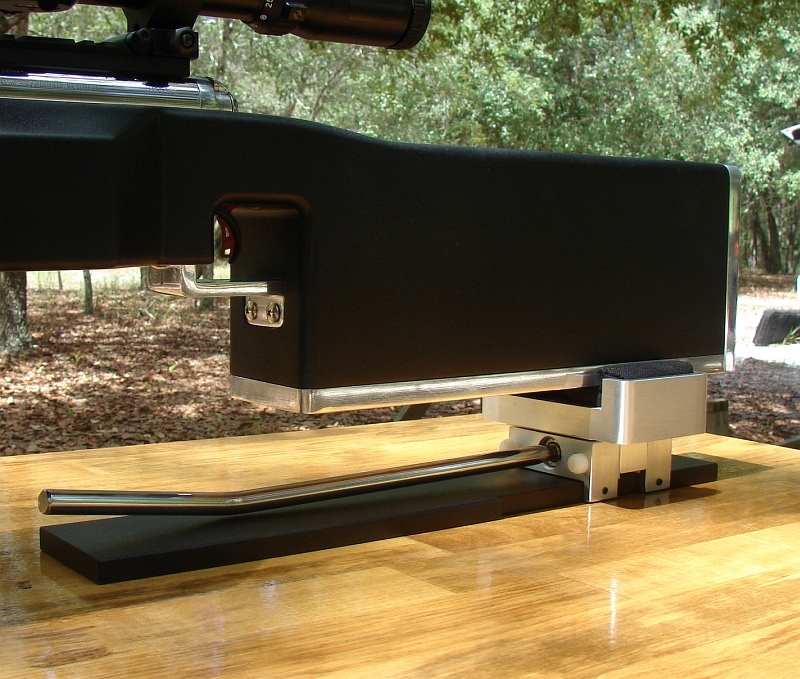 This record-setting Heavy Gun was chambered in 300 WSM by Mark King. 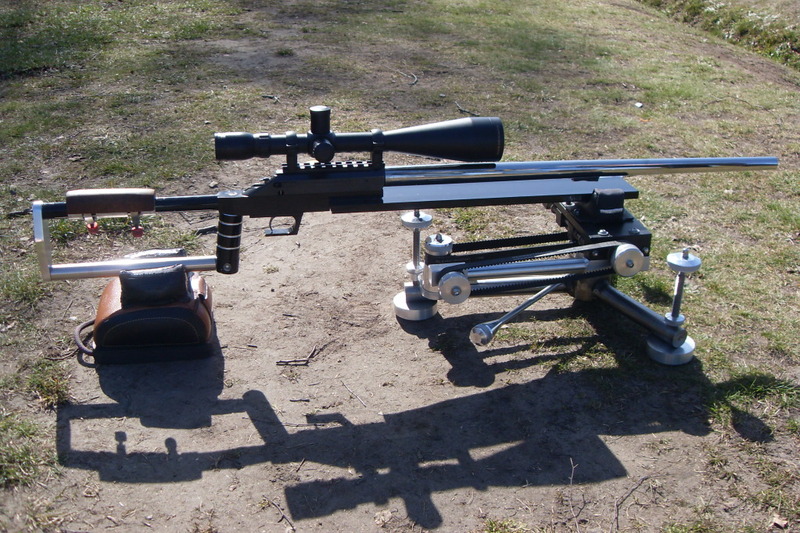 The gun features a BAT Model M action mated with a 30″, 1:10″ twist Krieger chambered to a .338 neck and finished off with a muzzle brake of Mark’s design. 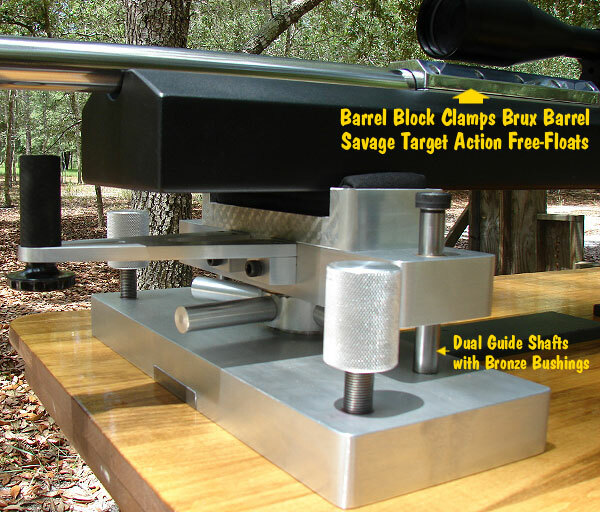 The barreled action is held with a clamp-style barrel block. 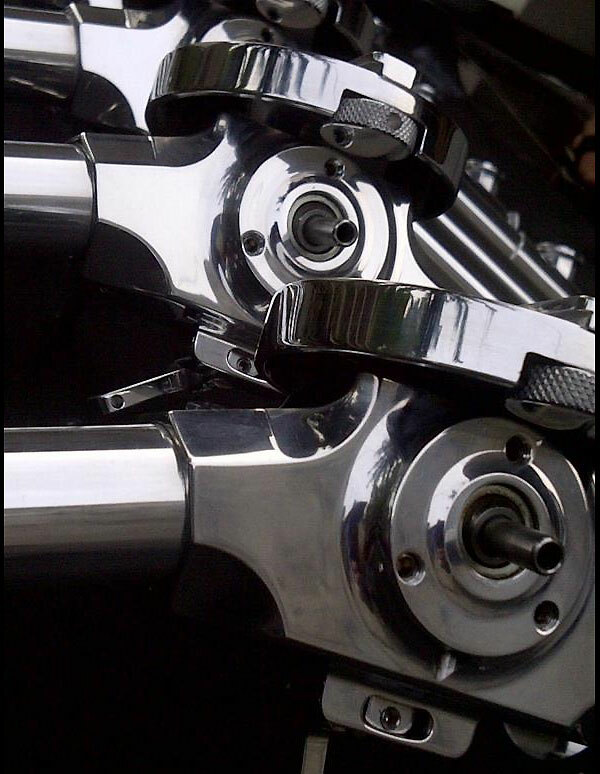 The stock incorporates stainless steel rails fashioned by Mike’s friend and machinist Steve Reimers. … Stay tuned to the Daily Bulletin. We hope to provide a follow-up story with more photos and more information on Mike’s record-setting rifle (and the ultra-accurate ammo he feeds it). 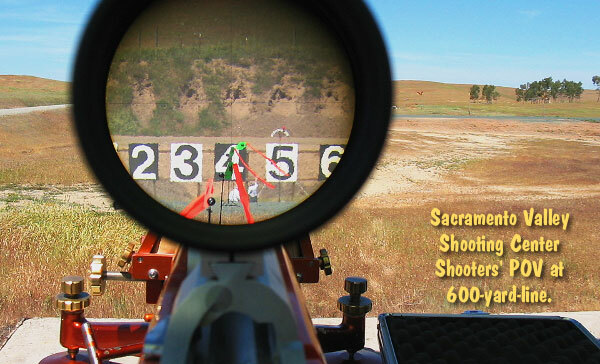 Share the post "Offset Heavy Gun Set Three IBS 1000-Yard Records in 2012"
Share the post "Richard Schatz Wins 2013 NBRSA 600-Yard Nat’l Championship"
Need a hunting scope? 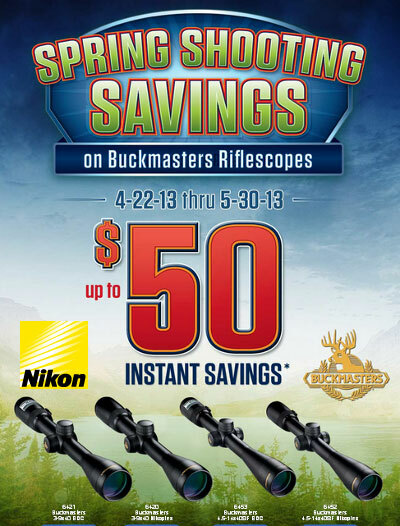 With Nikon’s recently-announced Spring Shooting Savings promo, you can get $30.00 to $50.00 instant savings on select Nikon Buckmasters® riflescopes. 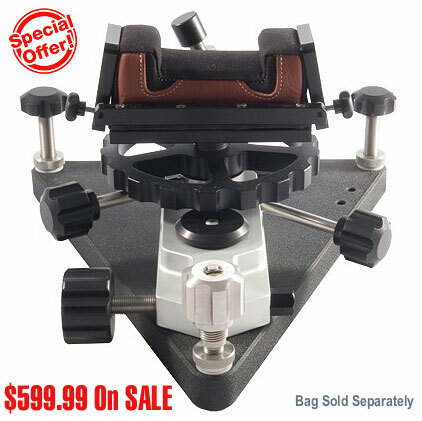 The promotion runs from April 22 through May 30, 2013. For more information, visit www.NikonPromo.com. 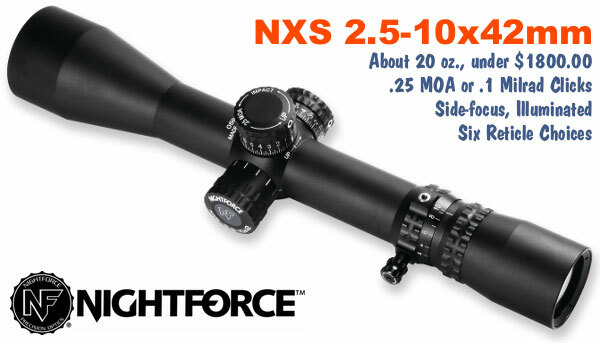 For more information on Nikon’s full line of riflescopes and other optics visit www.NikonHunting.com. 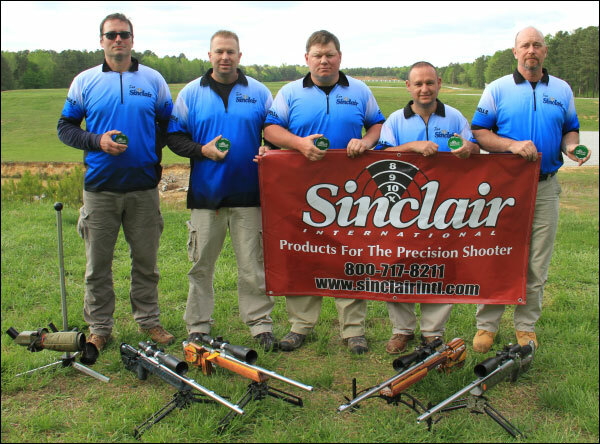 Share the post "Nikon Offers Up to $50.00 “Instant Savings” on Hunting Scopes"
The first-ever Sinclair International East Coast Fullbore Nationals (ECN) was held at Camp Butner (NC) on April 18-21, 2013. Hosted by the North State Shooting Club, this first-time Sinclair ECN attracted many of the nation’s top shooters, and we know the event will grow in popularity in the years to come. The Camp Butner range served up very challenging conditions for the four-day competition. This match definitely offered shooters a chance to test their wind-reading skills. There was a strong turn-out with 27 F-TR shooters, 21 sling shooters, and 9 F-Open competitors. A Team Match event followed the regular match relays each day. 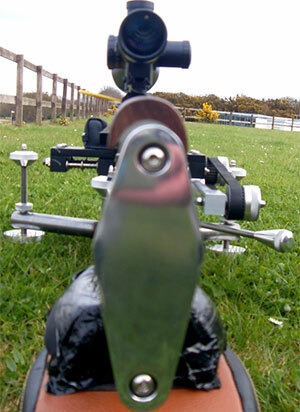 The firing points consisted of 300, 500, and 600 yards each day plus a long range portion. 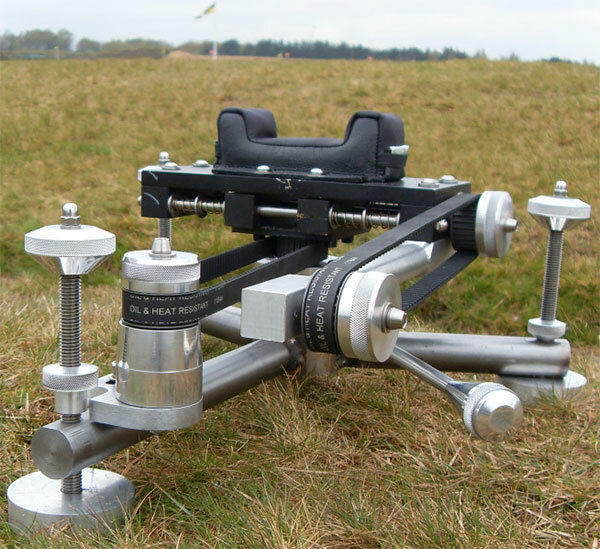 This included 900- and 1000-yard segments shot on alternating days. 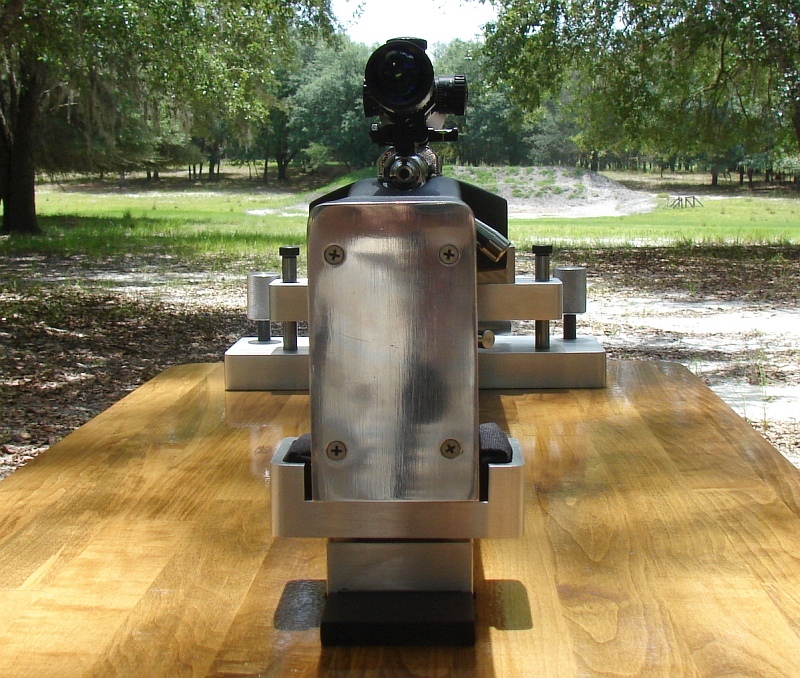 This enabled shooters to test their skills twice at each long distance firing point. For the first two days of the match, temps were in mid 80s and there were blustery tail-winds that switched in erratic fashion. The final two days of the 4-day match gave shooters the opposite conditions with opposing headwinds and highs in the 60s. This kept shooters on their toes as wind values and directions constantly shifted from left to right and back again. In the afternoon, winds increased with pick-ups that pushed 25+ mph. To top that, as the shooters pressed on to complete their relays, local radio stations were broadcasting tornado warnings for three counties to the west. The BNX/21st CenturyShooting Rifle Team won the F-Open Team match with a score of 1516-43X. Members of this team are: Robert Burton, Luis Eljaiek, Tom Goodman, and Nikolas Taylor. Among the sling shooters, the local North State Shooting Club Team won the NRA Fullbore Prone team match with an aggregate score of 1552-61X. The team consisted of John Friguglietti, David Huskins, Norm Crawford, Russ Jones, and JP Young. 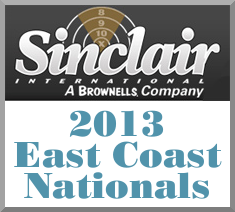 Share the post "Sinclair International 2013 East Coast Nationals"
This story first appeared last year. We’re featuring it again by popular request. Some of our mechanically-skilled readers chamber their own barrels or bed their own stocks. But these are relatively simple tasks compared to the jobs of constructing an entire rifle plus building an advanced front rest from scratch. 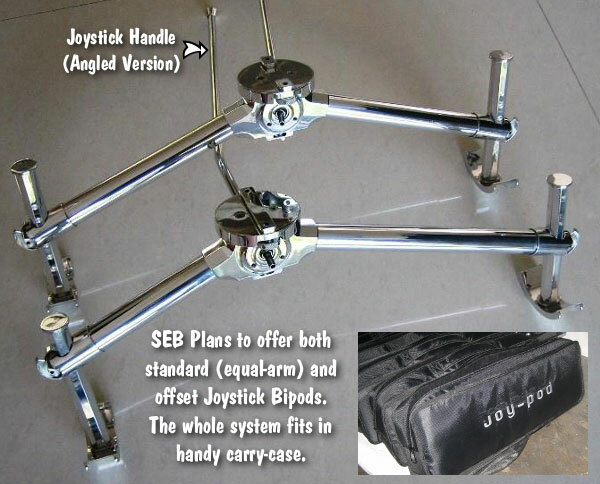 Well that’s exactly what Forum member Steve B. (aka Essexboy) did. 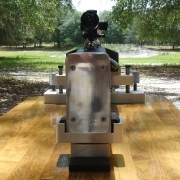 He built his own rifle and an impressive twin-belt-drive pedestal rest. (Click photo below to see large version). And get this, Steve’s home-made rifle was victorious in its first-ever match. Steve reports: “I shot my first Comp with the rifle this weekend and managed to win with a score of 239-21!” (The match was shot at 300/500/600/1000/1100 with English scoring of 5 points for center bullseye). Steve, who hails from Essex in the UK, constructed virtually every component of his skeleton-style rifle except the 28″ HV Bartlein barrel (chambered as a 6mm Dasher) and the Tikka 590 donor action. 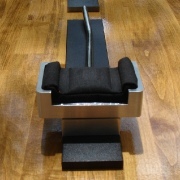 Steve also did all the design and fabrication work on his one-of-a-kind front rest. 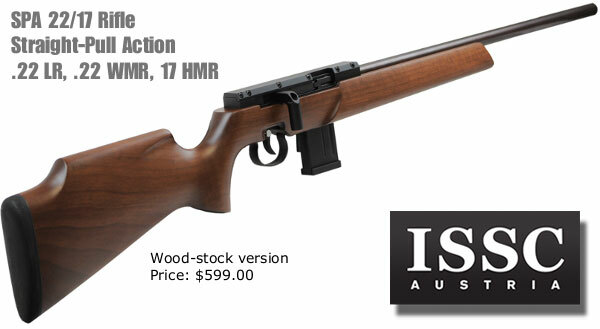 Steve tells us: “Over the last year or so, I made this rifle stock and rest. I managed to make it all on a little Myford Lathe, as you can tell I’m no machinist but it saved me a load of money — so far I’ve got about $200 invested plus the barrelled action. 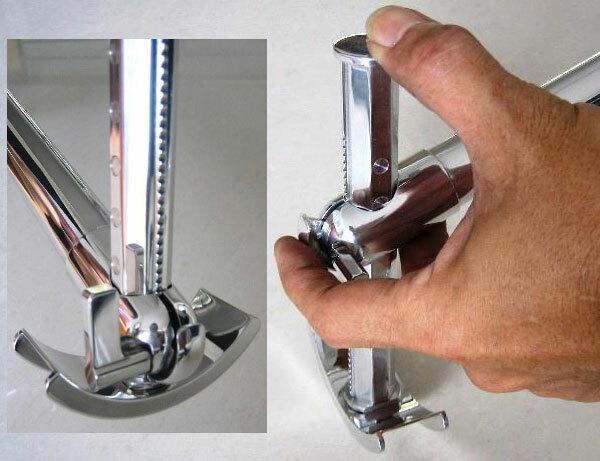 The stock is aluminum except for the stainless steel bag runner. 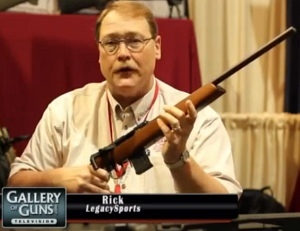 The rifle came in at one ounce under weight limit for F-Class Open division.” Steve did get help with the chambering and barrel-fitting, but he hopes to do all the barrel work himself on his next project. 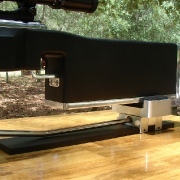 Share the post "Forum Member Builds DIY F-Class Rifle and Belt-Drive Rest"
Using digital publishing software, the NRA is now offering iPad-optimized versions of American Rifleman and American Hunter magazines. These two magazines are now available for iPad-using NRA members who download the NRA Magazines App in the Apple App Store. As Official Journals of the NRA, American Rifleman and American Hunter are available exclusively to NRA members. You must be a current NRA member to access these digital eZines. To join the NRA visit Membership.nrahq.org or call 1-877-NRA-2000. For a limited time, all NRA members who currently receive their magazines in print will be able to download the iPad editions. To get the new iPad editions of American Rifleman and American Hunter, NRA members can download the free NRA Magazines App from the Apple App Store. 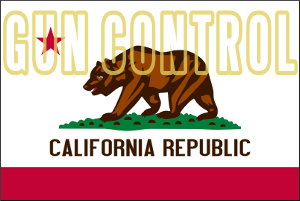 Once downloaded, launch the app and enter your NRA membership number and last name. Upon verification, the magazine you currently receive as part of your NRA membership will be displayed. Tap “download” to have the digital magazine delivered directly to your iPad and start enjoying all of the exciting new interactive features. Share the post "Now on iPad: American Rifleman and American Hunter Magazines"